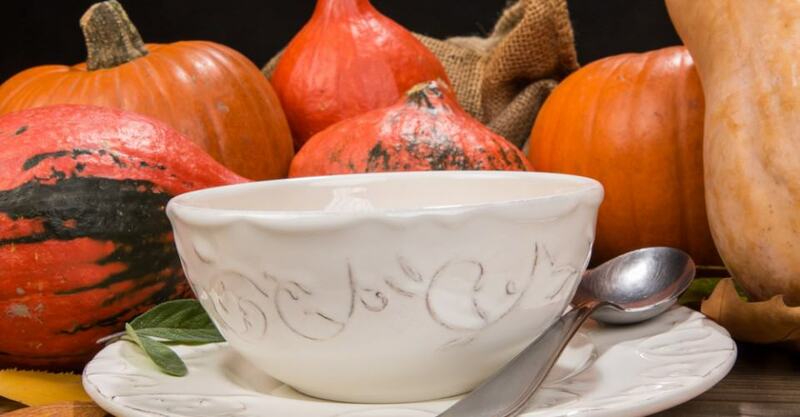 Every year I reach out to #healthy chefs, healthy cookbook authors and culinary institutions to provide healthy #fall #soup #recipes The recipes need to be low-calorie, whole ingredients, and little or no unnecessary sugar and fat. In a large pot, bring the broth to boil on high heat. Add the lentils and rice; stir. Reduce the heat to medium-low and cover. Simmer 35-45 minutes. Meanwhile, heat the olive oil in large skillet on medium-high heat. Add the carrots, celery and onions; sauté 10 minutes to soften the vegetables. Add the cooked vegetables to the simmering broth mixture. Add the cumin, salt, seasoned salt, lemon pepper and black pepper; simmer uncovered for an additional 20 minutes. If the soup is too thick, dilute it with more broth or water. Stir in the lemon juice. Taste and adjust flavor as needed. Ladle into soup bowls and garnish each with a sprig of Italian parsley. Note: The soup’s flavor becomes richer if it’s prepared a day in advance, refrigerated, and reheated before serving. Strain the stock if necessary and reduce it by half without adding any additional salt in order to intensify the flavor. Add the ginger and bring to a boil over medium-high heat. Reduce the heat to medium low and allow the stock to absorb the ginger flavor for about 5 minutes, then remove the ginger. Add the chicken breast, snow peas, carrot and red pepper. Simmer for 2 minutes, then remove from the heat and add the soba noodles. Pour soup into warm bowls. Top with the green onion and serve hot. Enjoy! Nutrition information (per serving): 143 calories, 3g fat, 12g carbs, 2g fiber, 17g protein. Put the sliced ingredients in a large soup pot and add the onion, butter, thyme, black pepper, nutmeg and just enough stock to barely cover the ingredients. Cook until all ingredients are soft, about 20 to 30 minutes, watching and stirring. Healthy recipe by Hilton Head Health’s Healthy Kitchen Executive Chef Karla Williams. Preheat a sauce pot large enough to hold at least 10 cups. Add the carrot, onion and celery to warm pot, and stir until the vegetables are tender. Once the vegetables are tender, add the chicken stock and let it reduce to about 4 cups. Then add the seasonings, the turkey and the rice. Add the skim milk and bring the soup back to a simmer. Mix the cornstarch with the cold water to make a slurry. Add to the soup and bring the soup to a low boil, whisking until it thickens to chowder consistency. Pour the chicken stock into a large pot and set over high heat. cook until the squash is very tender. Mix in the cinnamon, nutmeg, cloves, and salt to taste. Reheat the soup as necessary. Corn chowder packed with fabulous flavors and good nutrition; all in one bowl. In large nonstick pot, heat the oil and sauté the onion, celery and garlic until tender, 5-7 minutes. Whisk in the flour and cook, stirring constantly, for one minute. Gradually add the milk and broth; bring to a boil, stirring for several minutes or until the mixture thickens. Lower the heat and add the corn and sweet potato, #cooking until the potato is tender, 6-8 minutes. Season to taste. Before serving, stir in the kale and cook several minutes.